My family lived in the part of Kennel Lane, South Green opposite the kennels part of the council estate so over the years I had quite a variety of journeys to school. As a five year old my first School was at Billericay Infants School in Laindon Road. Because of the position of our house Mum chose to walk us along the section of Kennel Lane without a pavement, past the entrance to the Essex Union Hunt and out on to Laindon Road and up the footpath along Laindon Road to the school. You can imagine what a slow and arduous journey this would have been for both Mum and me twice a day, with Mum pushing baby sister in the push chair. The route included two steepish hills in the route along Kennel Lane, one up and one down whichever way you went. The journey of course was twice as hard for Mum, as she had to return home after delivering me to school as well as turning out to collect me at the end of the day. It was essential that I ate a school dinner (that I detested) or took a packed lunch to eat in the cold prefab classroom. The only variety to this daily regime was when my dad, who worked rotating night and day shifts at Westen Union Cables in London, was changing his shift pattern. So after coming home from night shift and sleeping through the morning he got up and collected me with his bike and I had a ride from school on his crossbar along Laindon Road and home. The magic of Google earth and maps unheard of in 1959 shows the distance to be only 1 and a half miles and to be a 18 minute walk, I am sure our walking time to school must have been nearer an hour with Trevor dragging his feet every step of the way but on the home it probably only took 35 minutes!!! Fortunately this only went on for about 2 years as the new South Green Primary School opened in Hickstars Lane, which was just at the end of the road and I could walk and go by myself. The age of eleven years old brought the inevitable change of school. 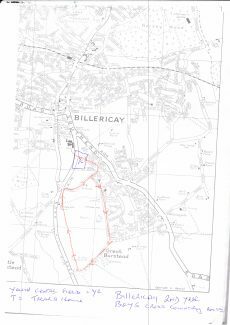 Which was to Billericay Secondary Modern so I walked to school by myself self via Langham Crescent, joining up with friends at the bottom of Bell Hill to reach the school in School Road taking with me usually two bags. First a leather satchel full of exercise books, text books, pens, pencils, eraser, set squares, protractor, compass for drawing circles (not for finding your way around school and to and from school) and logarithm, sine and cosine tables. In 1965 it was a few years before we learnt about the binary system and the future possibility of the existence of computers. It was not until 1970 after I had left school and gone to work were pocket calculators invented. The second bag was a duffle bag and this contained P. E. or football kit for which we needed black shorts and black plimsolls, if outdoors, and white shorts and white plimsolls if indoors and football boots, which in those days had studs and toecaps; we also had two aprons one for wood and metal work and another for art and pottery. Woe betide any one on who had the wrong colour/type of PE kit for the day or left it at home, the punishment for boys was usually a slippering. With this pantechnicon of stuff we shuffled around all day from classroom to classroom and to and from school without the luxury of a lift home in the family car. At the age of 13 I unfortunately got into a fight with Peter Abbey and Stephen Wade s, I changed schools to Mayflower School and this meant transport! Transport to school was a bike (see the top photo) and a ride to Billericay and through the High Street and Stock Road. Even in 1968 the morning traffic along Stock Road was horrendous. I remember being passed and cut up by anything up to 6 enormous fuel tankers, mainly Shell oil and Goff bound from Coryton for places north of Chelmsford. The tanker drivers seem to have no regard for the cyclist and wet weather meant wearing a yellow sowester, which was particularly good for looking like an idiot. During school the bike was to be kept in the bike sheds near the gate of Mayflower. It seemed that whatever I did, at least once a week I would be faced with a flat tyre and a long walk home. Eventually, once my mum had gone back to work as secretary in London, I gave up the bike. Instead I was given a morning lift as far as Billericay station in the car and I made my way home by bus. If I was lucky enough to get out from school 3 or 4 minutes early, I would race across Stock Road dodging the cars and catch the 4p.m. number 234 bus that went to Sun corner via Perry Street. This bus travelled from Billericay station to Basildon via a very circuitous route through Ramsden Heath and Wickford. If I missed that bus, it was a half hour wait for the Chelmsford number 153 bus, and that was always late. From Sun corner it was a walk home unless I had managed to scrounge and save a few coppers for a ride on the number 251 or 254 bus down Bell Hill to Gatwick View. 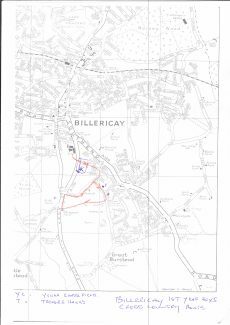 One has to remember that school at Mayflower was more arduous than Billericay Secondary as again there was all the books and PE Kit but a longer journey. My wife says a I was becoming a man not a wimp by that time. Soon in to my secondary school career we discovered cross country running which induced a painful stitch. I wince at the memory of it. 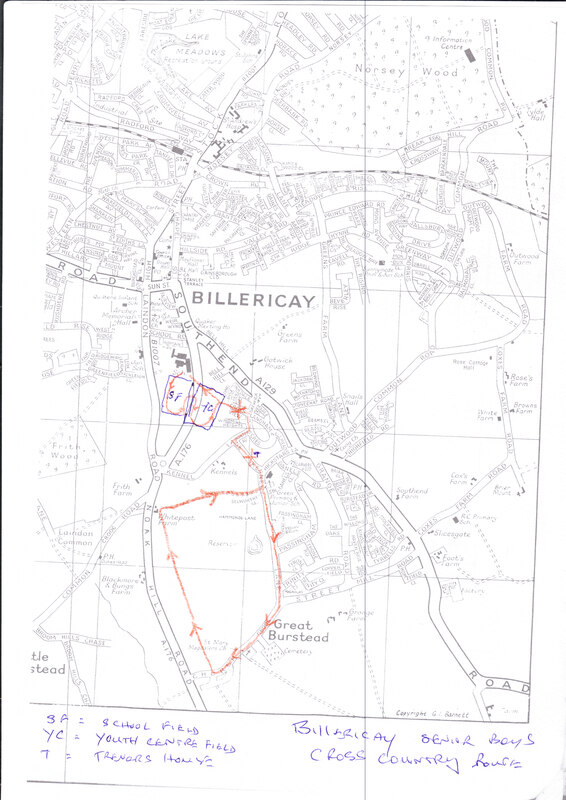 At Billericay School most of the cross country running routes passed my house, so on occasions me and my mates would call in for a drink, biscuit or a quick wee. 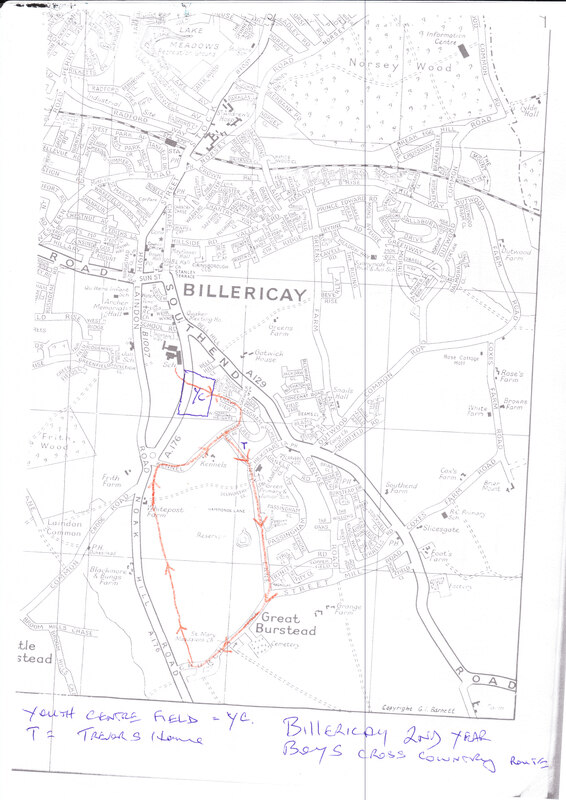 However one day in the 2nd year we nearly got caught by the teacher as we came out of my house as he was following the runners about a ten minutes behind (1966/1967 Maps of the Cross country circuits are attached). I wasn’t too bad at cross country and one year took part in the District race and came 32nd in our age group, the race was won by Duncan Beat another Billericay chap. It can be seen from the routes that girls had a much easier time of it when it came to cross country. 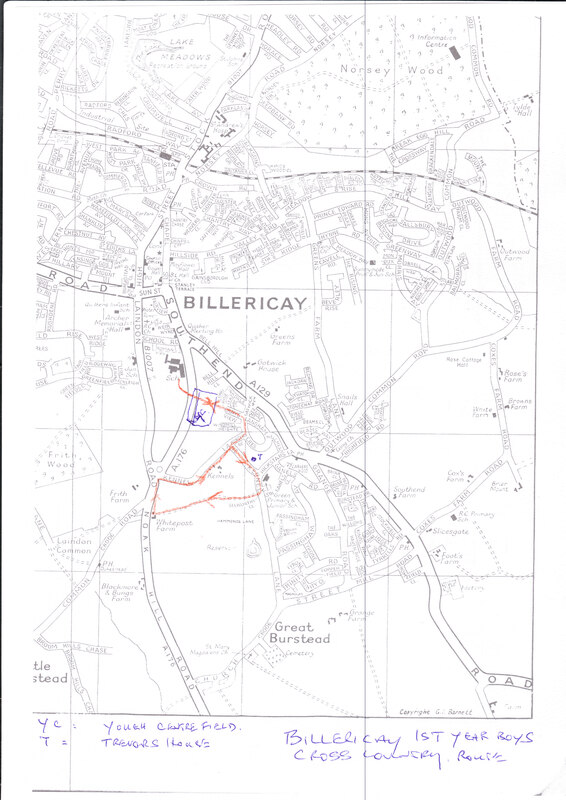 Billericay Secondary at that time took the subject quite seriously compared to Mayflower. 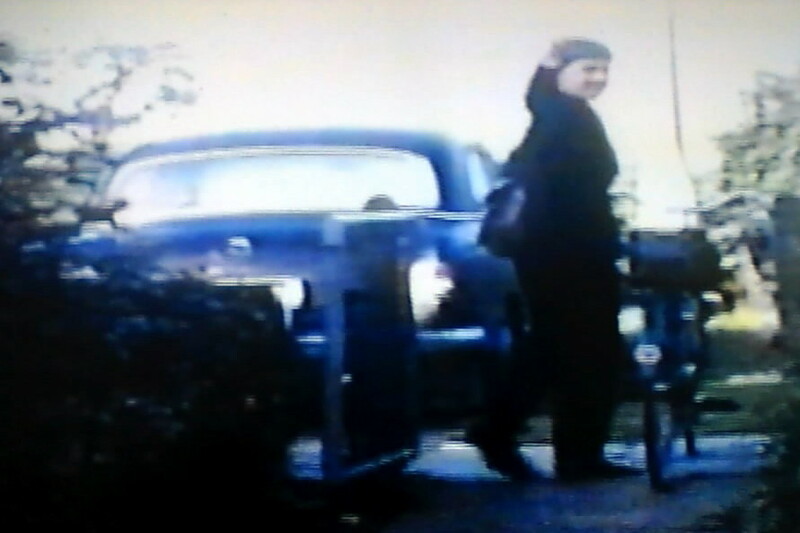 I apologise for the quality of the photo on the bike but it is actually transferred from a frame of 8mm cine film. 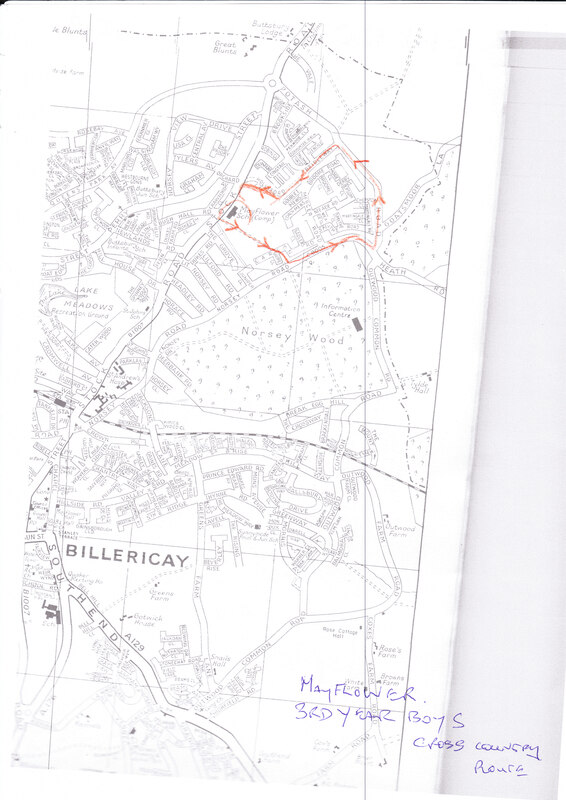 The Cross country maps are recent and drawn on a copy of a 1980’s Barnet street map. 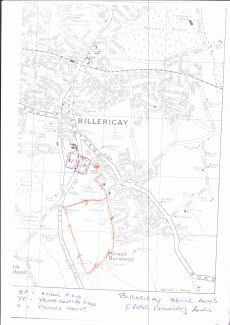 Those of you who are familiar with Billericay School in the 1950s and 60s will know that adjacent to the school playing field there was another field used by the locals for football and recreation and dogs. The only name I know for this field is “The Youth Centre field” it was immediately behind the houses in Cray’s View and adjacent to Buckenham’s the farmers field in Kennel Lane to the south. It shared a boundary with the school field to the north. I think it may have been larger than the School field it certainly wasn’t smaller. 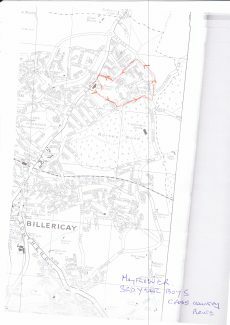 You will see that most of the cross country routes either crossed this field or went round the perimeter of this field. The Youth Centre field was lost when they built the new road to Basildon between the top of Bell Hill and Kennel Lane, the remaining part of the field gradually being built on with houses. To the North at the top of Bell Hill opposite the Mill cottages and adjacent to the Youth Centre field there was (it may be still unimproved) an area of rough land which was good for the rough riding of bikes it had a partially filled in pond and plenty of undergrowth so it was good for dens and various combat games. – Happy days. I knew Trevor as a friend for quite some time until he left Billericay Comprehensive School. I remember the school cross country runs and used to run alongside my mate Peter Krengel. During one of the runs we stopped off for sweets at a shop near Great Burstead and when we came out was confronted by the sports master who confiscated the lot!